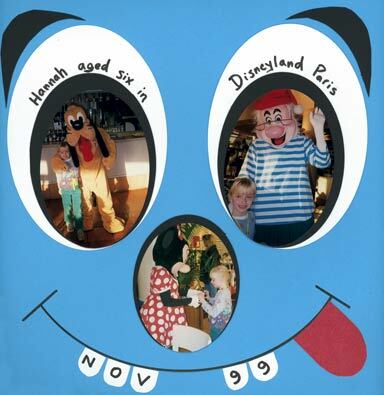 Disney scrapbook layouts are great fun, like going to Disney itself. You’ll have had lots of opportunities to take snaps of you and the kids standing next to Mickey or Goofy, or whatever you call your husband. Those hot and hard-working actors inside those suits will have enjoyed posing for your future Disney layout. It gave them a rest from all that autograph-signing they have to do. Not easy with giant paws on your hands! I’ve been looking for a gallery of really excellent Disney layouts and I had to dig around a bit. But this gallery at ‘Scrapping the Magic’ has got some fab pages on it. 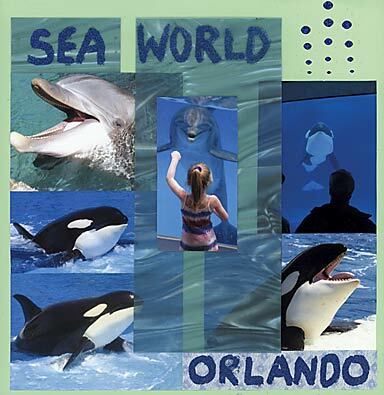 It’s not just resort-based, though there’s nothing wrong with scrapping Seaworld, Epcot Centre, Universal Studios etc. There are some great layouts around Disney movies too. The ‘Ratatouille’ page is my favourite. I’ve not gone overboard with Disney pages personally. In truth I’m not a ‘big ride’ kind of guy! But here are my two offerings, the first – although the photos are not great – is a page I’m humbly proud of. Disney layouts can really benefit from colourful Disney embellishments , and there are plenty to choose from. My ‘face’ design layout doesn’t carry any because I felt the impact of the face might get lost somewhere.